SAO PAULO (AP) — The number of indigenous Brazilians running for office has surged this year at a time when many feel their cultures and lands are more threatened than they have been in decades. At least 120 indigenous people are running in Sunday’s elections for offices at state and federal levels. While that’s a tiny fraction of the more than 25,000 people running overall, it’s a 60 percent increase over the number of candidates in the last elections in 2014, the first year in which authorities collected information about candidates’ ethnicities. “We’re tired of being invisible. We’re tired of people speaking for us. We want a voice,” said Airy Gaviao, an indigenous candidate for the local legislature in the capital of Brasilia. Only one indigenous person has ever been elected to Brazil’s Congress: Mario Juruna from the Xavante people, who served one term in the 1980s. It’s unclear if any of this year’s candidates can end that drought, though widespread anger at Brazil’s traditional ruling class could favor candidates perceived as outsiders. Less than 1 percent of Brazilians — around 790,000 — count themselves as indigenous, their numbers decimated by disease and oppression following the arrival of Europeans and African slaves whose descendants now make up the majority of the country’s current population. Many of the more than 300 distinct indigenous peoples live at the margins of society. Some reside on isolated land reserves much the way their ancestors did, while others dwell in impoverished urban pockets. As a whole, they are poorer and less literate than the general population and face continuing prejudice. But indigenous people have played a growing role in Brazil’s larger culture since the country’s return to democracy in the 1980s. The increased political participation seen now may also be one of the dividends of policies such as quotas and scholarships that improved indigenous people’s access to universities in the mid-2000s, said Luis Roberto de Paula, a social anthropologist who has studied the issue. It also reflects fears that their cultures and lands are under serious threat. Many indigenous lands are fertile and hold native forests or rich mines that have prompted farmers, ranchers, loggers and miners to try to open them to development — sometimes by force. 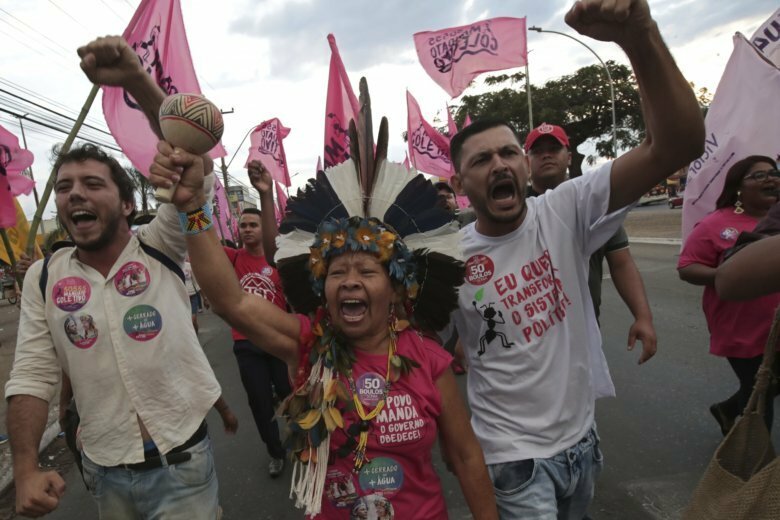 While the indigenous agenda has struggled under previous administrations, the Coalition of Indigenous People of Brazil has accused President Michel Temer’s government of the worst attacks on their rights in 30 years. Indigenous activists are especially concerned about a recent rule that they say will make the recognition of pending land claims virtually impossible. Many fear the situation could get worse. The man leading presidential polls for Oct. 7 elections, far-right congressman Jair Bolsonaro, has said he would not recognize any more indigenous lands if elected. While Bolsonaro’s running mate, retired Gen. Hamilton Mourao, described himself as indigenous when he registered as a candidate, he’s far better known for his military career. He outraged many indigenous Brazilians by saying the country inherited “indolence” from its native peoples. Another vice presidential candidate, activist Sonia Guajajara, has helped bring indigenous issues to the national stage, though her tiny Socialism and Liberty Party has little chance of winning more than a small share of seats in Congress and at state levels. Brazil’s 1988 Constitution recognized indigenous people’s rights to their native lands and called for the official demarcation of those areas within five years. But that process remains unfinished, partially because of bureaucracy and resistance by powerful agribusiness, mining and other commercial interests. More than 405,000 square miles (1 million square kilometers) — much of it in the Amazon — have been designated as indigenous territory, but indigenous groups claim another 40,500 square miles (105,000 square kilometers) that are still somewhere in the process of designation, according to the non-governmental Socioenvironmental Institute, which works on environmental and human rights issues. Bolsonaro and lawmakers from the rural caucus that represents large landowners in Congress have argued that demarcating indigenous lands shuts them off from economic development. Defenders of demarcation say that’s partially the point: The lands become the property of the federal government for the exclusive use of indigenous people — and become better protected from degradation and deforestation. Last year, 70 people were killed in land conflicts, the most since 2003, according to the Pastoral Land Commission, a non-governmental organization that tracks violence. For now, a flood of corruption scandals has shaken Brazilians’ faith in their democracy, hardened partisan divisions and unleashed a tidal wave of “throw the bums out” anger — factors which could benefit indigenous candidates who tend to be newcomers and not tainted by scandal, said Junior Xukuru, an indigenous candidate for the lower house of Congress. While indigenous candidates have seen some success in local politics — 136 were elected in the 2016 municipal elections, including seven mayors — getting to Congress is crucial, said Juliana Cardoso, whose father is from the Terena indigenous group. Associated Press journalist Victor Caivano contributed to this report.